The oldest predecessor to the present-day chateau was an early Gothic castle built around 1250. In the Middle Ages the castle was alternately an aristocratic property and a site of royal administration. In 1562 King Ferdinand I sold Hluboka together with inheritance rights to the Lords of Hradec who changed the castle into a Renaissance stately home. A century later the Hluboka estate was bought off by Jan Adolf I of Schwarzenberg, a noted European diplomat and the founder of the family branch which had stayed in South Bohemia for almost three hundred years. 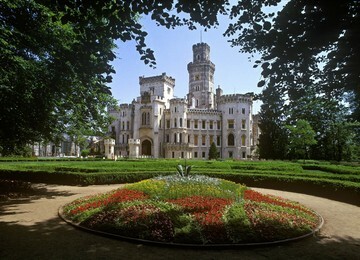 At the beginning of the 18th century Prince Adam Frantisek, Jan Adolf's grandson, had the chateau rebuilt in Baroque style by P. I. Bayer and his successor E. Martinelli.